That was an excellent posting, thank-you. Does HIPAA apply to Joe/Jill Schmoe on the street? I thought it only applied to healthcare providers and their support staff. Then again, I haven’t had reason to get training in it in pretty much ever. It was becoming A Thing about the time I wasn’t working in medical admin anymore. This correct. HIPAA only applies to the healthcare professional. Once it gets into the hands of a non healthcare provider it is a privacy act issue. I believe you are correct, under the first amendment you as an individual have the right to make any non libelous statement… if you have to prove this woman is under the care of a psychiatric professional to prove this then so be it. HIPPA applies not only applies to healthcare providers, but to anyone who would have access to a patients. I work in a hospital as a non-healthcare provider and even if I see someone in the hospital that I know I cannot mention it to some one else without there permission and that’s just a lesser breaking of the rule, so divulging someone’s medical information is a whole other ball game! HIPAA has some wider rules in general that extend beyond, It would be a liability issue I think, and the fines for a HIPAA violation are steep and can carry jail time. It’s a prudent action since fines can be in the millions. Is it possible to supply the entire testimony of Mrs. Capobianco? Thanks! Lisa, we will try to get that all up. The direct was rather boring. Bear with us. It takes some time to scan them all and get them up. With busy schedules, it might take a little while. I mis-typed. I meant to ask if Mr. Capobianco’s testimony was available for review? There was really nothing of interest in his testimony other than one joke regarding his wife’s age. It was rather short and dry which is why it was never discussed. Actually, that’s the cross only. ACVSBG, with access to the direct – kudos! Those are our documents we’ve uploaded to Scribd that you point to. She is actually asking that we add more to those. Sorry for the confusion. What I don’t get is why the child’s (or any person’s, for that matter) Indian heritage should count more than any other ethicity in her heritage. Conflating ethnicity with tribal citizenship is a common misconception. Simply having Native ancestry does not guarantee enrollment and citizenship in a tribe. Many people have ancestral heritage, and some with far greater “blood quantum” than Veronica, yet do not meet enrollment requirements of any tribe. Every sovereign nation chooses its own citizenship requirements; for example, the United States grants citizenship by birth or through passage of a citizenship test. Cherokee Nation requires direct descendancy from the Dawes Rolls, it does not have a minimum blood quantum requirement. Veronica’s Native heritage doesn’t “count more”, it grants her citizenship in the Cherokee Nation, in addition to being a citizen of Oklahoma and the United States. homeschoollori…here is the thing…you are talking to a white adoptive mama here, so I am not giving you my personal bias, ok? I am giving you what i have found when I did research and really started to look into the same question. It is NOT really about her Indian *ethnicity* being more important. It is her CITIZENSHIP in the Cherokee Nation. So, for the sake of example…let’s just say, a child is born to a couple that are 95% plain hold Heinz 57 variety white(black, green, does not matter, you get the idea)…5 percent German(between them)…but, one of the parents is an actual German citizen…and the child is BORN in Germany to this German parent. The couple split up mid pregnancy and a couple from the United States wants to adopt the child…now, just follow that thought through…there would be MULTIPLE documents/strips of red tape to deal with before that child could be removed from the country. Now, let’s step back and apply this to a child who is a citizen of the Cherokee Nation *within America*. A sovereign nation within a sovereign nation. One other note…the ICPC that everyone talks about is a safety net, of sorts, created to address specific issues within our 50 states before one state can release the child to another. And, at least PART of the job(a big part, really) it does is establish that this child is/is not a rightful citizen of a sovereign nation, other than the plain old US. One of the primary issues dates ALL the way back to Veronica’s birth(and now, to the birth of Deserai as well)…in Veronica’s case, that ICPC was filled out incorrectly…and as a result…she slipped right through the safety net design, at least in part, to protect the rights of the child as a citizen of a sovereign nation such as the Cherokee(or Absentee Shawnee, or whatever nation the child has been born a citizen of). Any sovereign nation on this planet has the right to be involved in the decisions made for it’s citizens. Jessica Munday is a joke. I think she was trying to boost her business by taking on the C’s and make a bigger name for herself . She is tripping over the brick road she laid with all the evidence that she claimed was false slapping her in the face with truth. She is sloppy and in no way would I put my livelihood in her or her companies hands. Jessica Munday of Trio Solutions in Mt Pleasant SC says she assisted Melanie Duncan Capobianco because Melanie is her personal “friend.” But one of Munday’s clients is MST Services in SC, where Melanie Duncan works as a PhD “child psychologist.” So Munday offers professional services for Melanie’s employer AND gives a “favor” to her friend of the same MST Services? 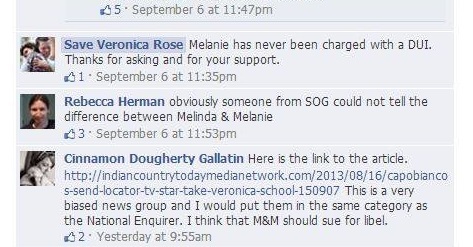 Is Melanie a client or a friend? Really, Ms Jessica, this whole thing is unethical. And to think that Trio Solutions also has a number of childrens medical organizations as their clients. Munday’s participation in this most unethical adoption of Baby Veronica is a blotch on her resume. I would like to read the direct exam of Melanie. Any chance you will be releasing matt’s testimony? Thanks! Your site is great! Thanks Alayna. As we told another person, the pages take some time to scan and post. With busy schedules, bear with us, we will try to get that up. However, I assure you, it’s rather boring. I think there may be info there that would need redacted as well. We try not to post other party’s info so let us take a look at all of it. thank you for your hard work. Yes I wonder of Matt has a temper issue. He seems almost out of control at times. “the have your bags backed” press conference. I’d like to hear his deposition when you get a chance.